A plastic cup that can be reused without washing it, simply because contamination has no chance to stick to the surface? 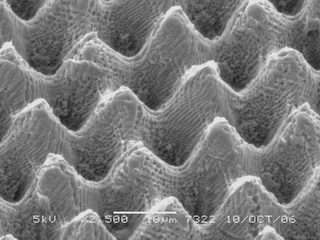 A self-cleaning surface like that of the leaf of a Lotus plant is ideal for many applications and consumer products. These ideal natural properties can be imitated remarkably well now. Structuring a plastic or other surface is now possible by using an ultra fast femtosecond laser. PhD student Max Groenendijk of the Applied Laser Technology Group of the University of Twente (Netherlands) presents remarkable results with this new technique. The secret of the Lotus leaf can be found in numerous tiny pillars with a wax layer on top. Water drops are lifted by these pillars, get into a spherical shape and can simply not cover the surface. Dirt gets no chance to stick to the surface via water. The spherical drops roll off and take dirt particles with the, Again, nature proves to be a source of inspiration for the laser scientists of the University of Twente: they aimed at creating similar surfaces, but without having to use wax. They succeeded in that using an ultra fast femtosecond laser. The light pulses are so short that they can be seen as light ‘bullets’ with which the surface is bombed. Max Groenendijk applies the laser in two separate steps. During the first step, the surface gets a fine ripple structure. This is caused by a special self organizing effect that works for almost all kinds of surfaces. Whenever the laser removes some material, a pattern of ripples is formed at the bottom. It is possible to influence this pattern with parameters like speed, intensity and polarization. The second step is writing a pattern of perpendicular lines. What remains is an array of pillars. These pillars then already have the fine pattern caused by the first step. This double structure replaces the need to have wax on the pillars, and makes the surface highly hydrophobic. Treating surfaces directly would be to expensive, but by using a mold, series can be produced in an economic and easy way. Even for materials that are quite hydrophobic by themselves, the structure can improve the properties drastically, Groenendijk concludes. Unlike in the unstructured, smooth situation, where droplets can still smear a little, the structured surface gives the spherical drops known from the Lotus plant. The ‘look and feel’ of the material also changes, especially the ‘feel’: a surface that has been treated, feels like silk. This could be an added unique selling point, especially for trendy products. To mimic the Lotus effect, several alternatives are available as well. It is possible to use a coating to make materials self cleaning, but an unstructured coating will never be as good as the new laser technique. Structured coatings could be an alternative, but applying a coating to a structured surface is another one Groenendijk is currently investigating, together with scientists of the Membrane Technology group.